The Oxton Village Plan is now complete. The work of a very energetic enthusiastic team. We should be most grateful to the people who prepared the questionnaire and guided the project to the completion. This document will form the blue-print for the future of the village. A member of the project team invited me to take my mind back to an Oxton of earlier days. I quite deliberately chose 1955 as a suitable time to reminisce, there being a convenient Ordnance Survey Map of 1955 and also this was the year I married and came to live in Oxton. I was no stranger to Oxton – in 1894 my father George Flower was born at The Bakehouse on Water Lane and he and his brothers and sisters attended the village school. Although neither family lived on the farm my father and his brother William were, from 1935-1945, tenants of Moorfield Farm. The accompanying map shows clearly the structure of the village. A quintessential English village. A village complete with Hall, Manor House, Church, Chapel, Smithy and Post Office. This was a time when the Vicar lived in The Vicarage- the Headmaster in the School House and the Baker in The Bakery! Sadly no more. This small community supported several shops, a Church, a Methodist Chapel, Cricket and Football teams, enjoyed the use of The institute and The Memorial Hall and of course was well known for the two Public Houses. Several of the village farms were still working, and together with the outlying farms formed an important source of labour. Today Desmond Palmer’s Windmill Farm is the only village farm. A very different place to the Oxton of today. Perhaps the best way to describe the village is to take a ‘virtual’ walk using the map as a guide. Remember, this is 1955 and we shall begin at the roundabout on Nottingham Road. On the left is the Police House followed immediately by the busy builders yard of T.V.Nix -a business employing some forty men in joinery, building and plumbing work. Many employees came from Oxton and the surrounding villages and furthermore many served their apprenticeships here. The business exists to this day. Our next stop is The Bridge Inn. We are beginning to see the family car becoming available and affordable. The Bridge had become a popular venue for excursions from town. We now turn left on to Main Street (interestingly called Back Lane on the map). Passing Forest Villas we now come to the recently built Council Houses on Elmcroft. The large Manor House- home of the Shipside family stands back from the road. The school playground abuts the street and during term time would be lively with village children. The school and house —the home of Mr. John Fenton and his family stand to the rear of the playground. The next stop is perhaps one which brings back memories to a previous generation. This is the Institute, a building constructed largely of tin and standing next to the school. This building was the home of the Mens Institute, and the Womens Institute. Popular for the Saturday night dances. The long drive leads to the Vicarage- home of the Reverend and Mrs Walton. The venue for the Church Garden Fetes, we were also welcomed here to join the Mothers’ Union and the recently formed Young Wives Group. The members of the Y.W.G. are now grandmothers! I trust you are still with me as we move on to William Severn’s Butchers Shop. This shop and small farmstead occupied the site between Quince Cottage and the Village Hall entrance. A typical village butchers shop, it would be adorned (in the season) with pheasants shot on the Estate. Mr Severn had no nonsense with ‘traceability’. His meat was bought ‘on the hoof’ and slaughtered and prepared in his slaughterhouse on Windmill Hill. Spare a moment to glance at the map. The next point of interest is the Pleasure Ground and Cricket Pitch. Still recognisable today —except of course we now have the Village Hall and Play Area. We move on to Home Farm. A large village farm and for many years the home of the Turner family. The buildings are opposite (now a housing development). Until the 1950’s most farms ran a dairy herd, Turners being the largest. Their cows, along with others from the smaller farms were moved twice daily along the street to pasture. Now, cows move very slowly and are not house-trained. Before anyone had thought of The Best Kept Village Award! Another glance at the map will show Smithy and here we approach Doughty’s Yard. Blacksmiths. Joiners. Agricultural Engineers Undertakers. In 1955 one could have the horse shod, the cart wheel repaired and even fill up the car with petrol from the pump in the yard (still there). The business is still on the same site, now in the capable hands of Roger- the third generation of the family. I mentioned the role they played as Undertakers. I recall my aunt’s funeral, when we the mourners followed on foot behind the coffin. Charles Doughty escorted the small procession along the Main Street to the Church. A ceremony performed with the true simplicity and dignity of a village funeral. Our ‘virtual’ journey now takes us across the road to Berridge’s General Store (now Forest House). In this Aladdin’s Cave one could buy anything from clothes pegs to Surprise Peas-remember them? I seem to recall that Jim Berridge actually kept the shop open until 7 p.m. on a Saturday night – something almost unknown in 1955. I once told Mr Berridge there was a mouse under some boxes. He handed me a poker and suggested I kill it. A lesson in how ‘to mind ones own business’. Turning the corner we come to The Green Dragon, second of Oxton’s popular Public Houses. At this time the Meeting Room of the Manchester Oddfellows Friendly Society occupied a large section of the area which is now The Dragon car park. This large two-storey building provided not only a Meeting Room but also accommodated four cottages underneath. In one of the cottages you will find Ernest (Babs) Strutt and his sister Nell. It would be true to say Babs takes this walk around the village every day. Nothing escaped his notice. This is 1955. The Strutt family has lived in Oxton for several hundred years. Directly opposite the Oddfellows Hall we find the Methodist Chapel. An active movement in Oxton. Next door is The Memorial Hall (strictly teetotal!) built in 1933 by the Methodist Church in memory of the great and the good of the movement. Because of some family connections, I rescued the commemorative plaque which is now stored safely in an attic. In 1955 The Memorial Hall was the only place in Oxton suitable for large public parties and here the W.I. held the annual Birthday Party. The Pioneer Club met here on a regular basis and each year presented their famous Pantomime. Back on to Blind Lane we turn left and after the row of cottages come to another cottage standing in a large yard and orchard (now Honey Croft Cottage). In 1955 this cottage- quite old and plain was the home of my Aunt Ellen Smith. From here she ran a small haulage business whereby her driver collected milk churns from the surrounding farms for delivery to the Carlton Dairy. In the afternoon the same lorry and driver delivered coal- no fear then of the ‘health and safety police’. Next door (now Jasmine Cottage) Miss Nellie Gibson ran the Post Office from one room in her cottage. Before we leave Blind Lane look over into Home Farm Yard and admire the grave of a Quaker member of the Sherbrooke family. Our route takes us back to the Main Street. We shall pass the farm buildings to Home Farm (now the Post Office and houses) and look in the direction of the Church. To the left is the handsome Oxton Hall, complete with stable block, laundry and out-buildings appropriate to a Hall of this size. Standing in extensive grounds the Hall as was the way of so many post war houses of this size in a state of ‘dignified decay’. Owned by the Sherbrooke family the building was demolished shortly after the sale of contents in 1957. Lord Charles Cavendish-Bentinck, veteran of the Boer War, was its last tenant. He died here in the early 1950’s. We pass the Hall grounds and the Church is the next landmark. The Church is well documented, however take time to look inside. Study the east window- a commemorative window to men killed in the First World War. A considerable number lost their lives. This is the only example I have seen showing the date 1914-1919. Obviously very few (including my father) would return home until 1919. On the south wall note a copy of the Official Citation to Captain Rupert St. Vincent Sherbrooke V.C. C.B. D.S.O. giving recognition of his bravery in the sea battle off Norway in 1942. A time to remember also the British Legion Armistice Day Parade. In 1955 this parade of the many Oxton men and women who had served in the recent war stretched back along the Main Street. The Salute taken by Captain (later to become Rear-Admiral) Sherbrooke. Passing Church Farm we arrive on New Road. On the corner we find Mr & Mrs Brown’s small store. Mr Brown also acted as Postman delivering mail on his bicycle. His area stretched out as far as The Fallows Farm. Mrs Clara Smith delivered mail to the north of the village. Mrs Smith on her bicycle delivered out as far as Singleton’s Grange and Forest Farm (now Oakmere Golf Club). We continue down New Road towards the ford. Around this time Mr Whitelocks had just retired from his Boot and Shoe Repair business. Mr Martin at the Bakehouse also retired in the early ’50’s. How well the village was served. Besides these village shops Kirkby’s of Southwell delivered on a weekly basis. The Manfield Co-op delivered bread and milk. Shaw’s of Lowdham called with their lorry packed with hardware and a ready supply of paraffin oil! The County Library Van called on Tuesday Lunchtime. Let us not forget the Mansfield Co-operative Society built a store in Oxton the early 1960’s although this was a rather short-lived venture. The site is now occupied by Malvern and Foxleas. We must however return to the plan. Return to Sandy Lane and on to the Southwell Road. The large house and grounds of Holly Lodge is (remember this is 1955) the home of Captain Sherbrooke. The Sherbrooke family owned practically all the land and most of the houses in the parish. A truly Estate Village. SO MUCH HAS CHANGED SINCE THE 1950’s. I suggest the number of houses has doubled yet the transformation has happened so slowly and seamlessly as to go almost unrecognised. Sadly the village school closed- only to be opened up as a Private School. We saw the sale and closure of the Methodist Church and Hall. The Village Hall built in the early 1960’s has become the focal point of village events. Built with the foresight and generosity of Mr & Mrs Thomas Bell, together with funds and voluntary work from many residents and friends,Oxton Village Hall has a secure future. Having taken our ‘virtual’ walk around the village of the 1955 era we could consider the changes taking place within the homes and workplace. Certainly there was a feeling of confidence and optimism. The war-time restrictions were ending. New houses were being built. Home ownership possible. Unemployment almost unknown. Television entered our living rooms! We were intrigued by our small black & white sets producing at best three programmes. With television programmes came new ideas. D.I.Y. suddenly became a week-end occupation and we had Fanny Cradock and her long-suffering husband to thank for the dreaded (my thoughts) Dinner Party. They gave birth to such treasures as the Prawn Cocktail and Black Forest Gateau. Suddenly we young housewives were pitched into the fantasy world of entertaining. Personally I could not see the sense and continued to use my faithful BE-RO Book (still a favourite in 2011) and ‘hand-me-down recipes from home. However we were fortunate to be part of the generation enjoying the affluence of the early 1960’s. Homes became more colourful-yet anything resembling a fitted kitchen was regarded as posh and domestic central heating was just a dream. Thankfully the ‘fridge/freezer was making an appearance although the dishwasher was almost unheard of. The new washing machine (a messy twin-tub affair) replaced the equally disagreeable electric copper. But anything was an improvement on the old coal-fired copper. Detergents, with their amazing qualities made an appearance. Home decoration took on a new confidence. Schemes became brighter with a taste for the geometric pattern . New materials were available. Nylon, rayon, plastic. Old white enamel bowls replaced by bright orange ones. Affordable nylon fitted carpets became affordable. Looking back they were quite awful. The nylon sheets did not work (even the bright red ones!) They were too smooth and shiny and the children slipped out of bed. Writing of children this is a time to remind ourselves that almost always the babies were born at home. The District Nurse and local Doctor would attend. We might be forgiven for remembering the endless piles of Nappies! Not for us the disposable kind. The new fabrics were dictating fashion and we ‘out in the sticks’ were keen to be part of the fun. Most of our creations were home-made on a newly acquired electric sewing machine. Yes, we really had arrived. Whilst equipment on the domestic front had improved this was nothing compared with the progress made in agriculture and other industries. Young men whose fathers had literally `followed the plough’ were now provided with state of the art tractors and sophisticated machinery and were not in the least phased out by the radical change taking place in the countryside. One can only admire the proficiency of these men who, with so much enthusiasm took on a whole new way of life within the agricultural industry. The urge to prosper and the determination to succeed so evident throughout the country. OXTON IS A SPECIAL VILLAGE. Although so much has changed over the past fifty-five years one can still take a quiet stroll along Fallows Lane or enjoy the slightly more energetic walk up Windmill Hill to the Camp. 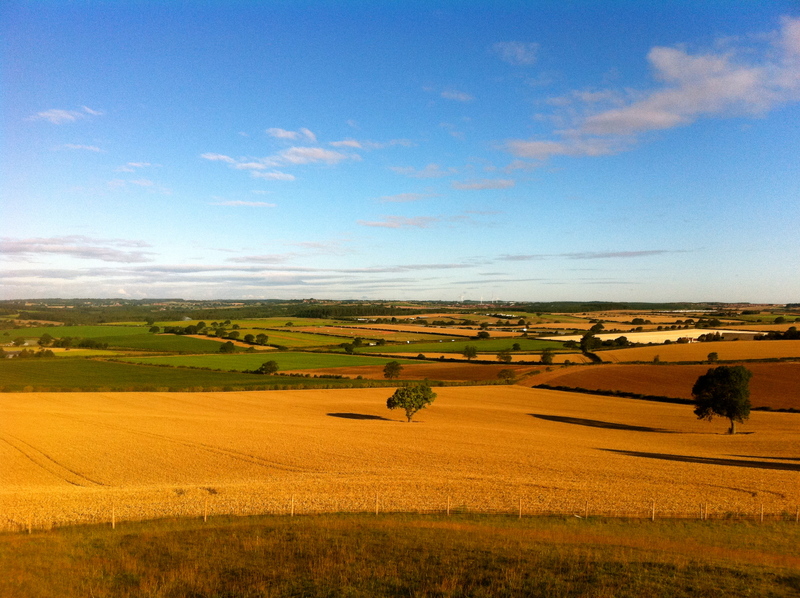 There can be no finer scene in Nottinghamshire than the panoramic view from here. The Pleasure Ground remains a delight and we should remind ourselves how fortunate to have this green space within the village. Some families have lived, and worked in Oxton for generations. Others have moved more recently bringing with them new ideas. For each there is a special attraction. 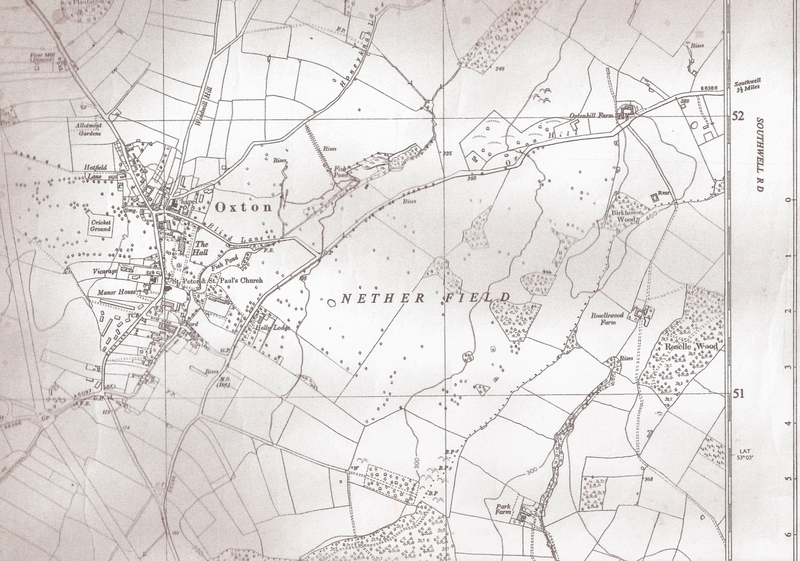 My own father’s family moved to Oxton in 1760. They worked a brickyard and later became bakers (similar technique, different recipe) until grand-dad Thomas Flower decided farming might be a preferred option. So here we are today when I am delighted to record that our grand-children George, Harry and Rory are the eighth generation of my father’s family to be born in Oxton. Our daughter-in-law Helen is a Church Warden and I am privileged to act as a Vice-President of the Womens’ Institute. Take a stroll around the village- and yes, Oxton is a very special place. I found this to be so interesting! As a newcomer to the village (we moved here last summer)it has given me a real insight into the history of the Village! Memories such as these are invaluable and we are lucky that people such as Mrs Lees take the time to share them with us! I look forward to reading many more from long standing residents of the Village, and will certainly walk a little slower throgh the village as I try to envisage things from Mrs Lee’s description of the Village as it was! Thankyou. Bravo Betty! What a fantastic article which I thoroughly enjoyed reading. Has I followed the the tour, it brought back so many memories, I was born on Chapel Lane in 1947 and living in Oxton until 1970, my brother Nick was born at 28 Elmcroft and lived there until his death at the early age of 49 years. My brother Bryn was born opposite the Blacksmiths on Forest Road. My mum was Gladys Davies and to those who remember her, she organised everything, she was Vice President of W.I. I think because she worked so hard for the members. An enjoyable and for me nostalgic read. Given the date of the virtual visit you would have probably passed me either in the school yard or walking down Main Street heading home to 18 Elmcroft. Born in Epperstone just after the war I moved to Bridge Cottages(opposite the pub) in 1947 then to Elmcroft in the early 50’s. Many happy childhood years were spent around the village, long Summer holidays, with mates like Robert(above), Denis Watson, Robert Burton, Gary Allwood and Gary Cooper to name but a few. The annual village fete in Oxton Hall grounds(before it was demolished) remind me of the community coming together. In those days we all knew each other, whatever your background or upbringing. I still treasure the hideous photograph of myself dressed as a golliwog(as in the famous brand of jam) snapped in the grounds at a summer fete fancy dress event- long before the days of political correctness and Health and Safety! My dear old mum used a burnt cork to darken my face and made a wig from black wool! Must have been good though because I won a prize along with Michael Parsons and Suzanne Barnby. Interestingly you mention Church Farm briefly, Mr Meads from Calverton as I remember was the tenant farmer in those days. A good source of income for us youngster during the Autumn (potato picking holiday). Hi Mick, great to hear you recollections of our early days in Oxton, as you say we knew everyone and everyone knew us youngsters, no doubt you remember Babb Strutt, no coming home late and saying it was earlier because Babb would know. Mr Meads was the farmer at Church Farm, not so sure I could pick potatoes now. I, drove through the village today, some very smart houses but Elmcroft will always to special to me. Philip Allwood how married Carol Hall lives in Farnsfield and my sister Annette often see’s them. What a wonderful trip down memory lane! I was born on Water Lane at Sunnyside where my grandparents, Fred and Grace Coton, lived. As I small child I remember living in a property off New Lane and then later at the Old Bakery next door to Sunnyside. We continued to live in Oxton until I was 16 but it always has and always will represent home to me. Teversal is a beautiful village but I still hanker after life in Oxton. That well and truly took me back to my childhood, wonderful memories! I was born at 22 Elmcroft and spent my first 11 years in Oxton before emigrating to Perth Australia with my family. My mother Kathleen Craig was born in a cottage on Water Lane along with her 6 sisters and 2 brothers. I will always hold Oxton close to my heart and even though my life is now in Australia I sometimes hanker for those carefree days of my childhood in Oxton. That took me right back to when I was a young girl in Oxton,and now I have just turned 60. Daughter of Ken and Gwen Kirby, Bill Severn , the butcher, was my Uncle Bill. I remember going to the Smith’s Sweet shop for his’ Woodbines’ and Gin!! We lived at Carisbrooke, 5, The Orchards. I have many happy memories of the Water splash, where my sister and I would play in summer with our friends Helen and Richard Nix. I went to Oxton School and remember Mr Fenton well, I think my teacher was a Mr Jones. My grandmother, Dorothy Kirby, taught piano lessons at the school for a while and her sister Auntie Florrie was married to Bill Severns. Many happy memories, so peaceful and a lovely childhood. I now live in New Zealand but have been back on several occasions to visit. I have just about given up on trying to trace any information on my Grand Mother who lived and died in Oxton sometime in the late 50s or 60s.I remember visiting her when I was a child.She lived in the row of cottages on New Road right next to the ford.I am ashamed to admit it but I never remember her name.My father was very secretive about his family and knew very little about them.All I do know is that her name may have been Mary and she married again.I understand this is not much to go on,but I would like to ask if anyone may have known her.She was married and her name would have been Marshall before she married again.